"... she performs with staggering intensity. The music was a complete revelation to me. The first track, McDougall's Gathering, makes the viola sound like I've never heard it. The instrument speaks with a massive, mythic power....... "
"...Spectacular display of fiddling artistry..."
"...stellar fiddling from an elegant master..."
"...the pibroch is a tour de force for Rideout, who cannily summons the sound of the Great Highland bagpipe with only bow and strings."" "Well worth waiting 200 years for." "Rideout's fiddle playing is at the pinnacle of the piobaireachd art...an optimistic return!" 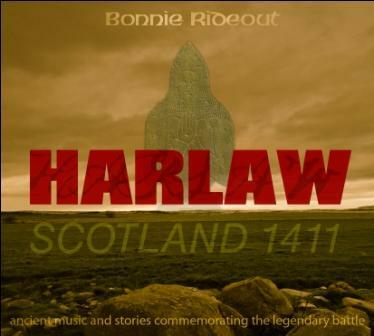 Internationally acclaimed Scottish fiddler BONNIE RIDEOUT joins forces with renowned musicologist DR. JOHN PURSER to present an exciting new double CD release honouring the 600th anniversary of the famous battle at Harlaw - July 24, 1411. For centuries this battle has been remembered in music and poetry depicting as many conflicting stories as the battle itself. For the first time in history prominent scholars and musicians from Scotland, America, Canada, and France have collected the songs and stories on a new, beautifully illustrated and comprehensive two CD project. Disc one features Rideout's stellar fiddle playing of three ancient piobaireach: The Battle of Harlaw, Cogadh no Sith (War or Peace), and The Battle of the Birds. Fifteen of the world's finest Celtic musicians join Rideout on this musical journey including Glenuig piping legend Allan MacDonald who sings and plays the powerful 500-year-old Gaelic incitement to the battle; Andy Hunter sings the 16th-century ballad, accompanied by Bonnie, and William Taylor on Celtic harp; and Elizabeth Stewart sings her commanding north-east Aberdeenshire version of the ballad. Several stunning solo versions of the ancient melody Battel Harloe are performed by Billy Jackson - harp, Ronn McFarlane -lute, Chris Norman - flute, Grant Herreid - theorbo, and more. On the final track, Barnaby Brown plays triple pipes reconstructed from 1000 years ago, and with Bonnie accompanying, creates a haunting and beautiful version of The Battle of the Birds. On the Narration CD, award-winning broadcaster and Scottish music historian, John Purser, tells the story of Harlaw and leads discussions with Elizabeth Stewart and Glasgow University Professor Alan Riach. Elizabeth tells a ghost story from the battlefield itself passed down from her grandfather of the Northeast travelling folk. The outstanding line-up of musicians accompanies the narration to create a beautiful and fascinating listening experience. 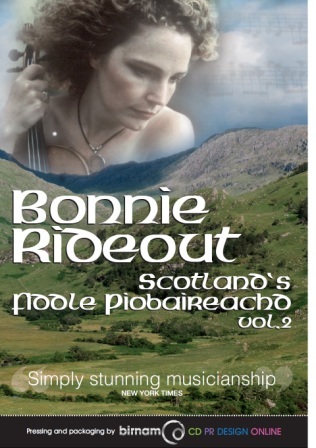 "Rideout’s contribution to the sustaining and development the piobaireachd art form is unmatched; and this CD is a landmark, not just in the history of Scotland’s music, but in the history of music for stringed instruments. These are ambitious works. Their themes are carefully constructed, and they are followed by extended variations, often thrilling in their technical demands; but their beauty and intensity amply reward both the performer and the listener." 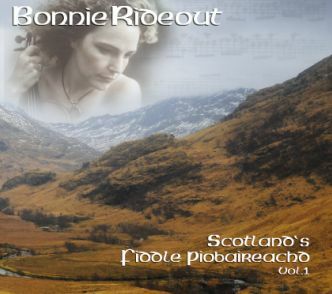 "...the gemstone is Rideout's Pibroch..."
National Public Radio has featured both recordings; Scotland's Fiddle Piobaireachd - Volume I and II, on Fiona Ritchie’s Thistle and Shamrock. Fiona also featured HARLAW 1411 twice in one year. Dowload her recordings on ITunes or order up today and find out why The Guardian, U.K. called her work "...a complete revelation." The list of performers participating in Bonnie's recording sessions continues to grow. Here is a sample of some of the wonderfully talented musicians taking part in the last three projects (listed alphabetically). We encourage you to visit their websites and see them in concert whenever and wherever possible! Click on "Scrapbook" for photos of her travels and the sessions. Bonnie has served for three terms on the board of Governors for the Washington D.C. National Association of Recording Arts and Sciences (NARAS). In addition to presenting the GRAMMY Awards, NARAS provides valuable services to communities across the country. To learn more, follow this link: www.grammy.com. Bonnie's music has been on the soundtracks of several PBS documentaries including six of Ken Burns' documentaries including "PROHIBITION", "The National Parks, America's Best Idea". http://www.pbs.org/kenburns Another interesting documentary is "Africans in America" on PBS and WGBH, Boston. The soundtrack was composed and compiled by Bernice Johnson Reagon. Bonnie's fiddling accompanied Sweet Honey In The Rock. Also featured is Uilleann piper Jerry O'Sullivan who has toured with Bonnie for many years. 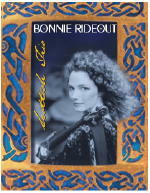 Mel Bay offers several of Bonnie's music books, the top seller is The Scottish Fiddle Encyclopedia (MB99268). This work is part of the publisher's ongoing Encyclopedia Series featuring many of America’s top acoustic musicians. This long awaited collection represents thirty-five years of tunes from Bonnie's vast personal repertoire. The Scottish Fiddle Encyclopedia includes 136 pages of fantastic tunes from the 18th century to the present. Now available on Bonnie's website store. For more Mel Bay music, click: here. In collaboration with renowned strings educator, Bob Phillips, Bonnie has written and compiled two full scores for jr. and high school orchestra. Published by Alfred Publishing, it has become a hit in schools nation-wide. Click here to order. 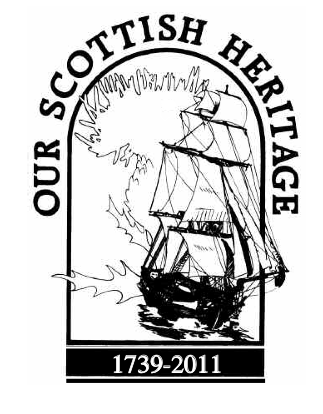 Bonnie was recently honoured with the Flora MacDonald Award from St. Andrew's Presbyterian College for her contributions to the arts and to the North American Scottish community. For more information please click HERE. Ms. Rideout is presently not touring in order to focus on her health after being diagnosed with multiple sclerosis. She intends to continue recording, so stay tuned for future musical offerings on CD or ITunes. For contact information, please send email to this address.